"BOO KA YA! YA! YA! BOO KA YA YA YA!" cheered Valdemar Kwaysser's throng of supporters, embracing their man as they collectively jumped up and down to celebrate his victory. We're not exactly experts in Eastern European languages, but from here it looked genuine, emotional, and utterly thrilling for the young man from Hungary who just captured his first WSOP bracelet. Matt Marafioti literally had to kiss the bracelet goodbye when his flush draw failed to come in on that final hand. As Kwaysser celebrated, Marafioti quietly walked back to the table, picked it up and stared at it longingly before walking offstage. Kwaysser has been wearing a plaid newsboy cap for the duration of this tournament and we're virtually guaranteed to see more of his lucky hat in the coming days. 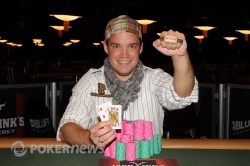 Hailing from Budapest, Kwaysser had already captured two major titles before today, winning the first-ever Latin American Poker Tour Event back in 2008 and taking down the Italian Poker Tour-San Remo main event last February. 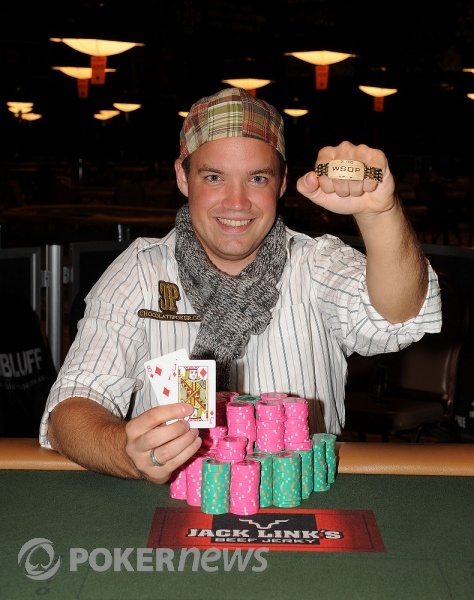 This is his seventh cash overall at the WSOP, his third this year, and at his first final table, he was able to close it out and come away with the win. Congratulations to Valdemar Kwaysser on a dominating short-handed performance and a spectacular victory. For all of us at PokerNews, thanks for following along. The sun is about to come up and our beds are calling. From the Rio in Las Vegas, good night and good luck. Matt Marafioti raised to 200,000 before the flop, and Valdemar Kwaysser made the call to see a flop. Marafioti was behind, but he had a ton of outs to draw this match back to even at four million chips apiece. The turn wasn't one of his out cards, but the was a good miss as it gave him another six outs to make a straight. Marafioti was smirking nervously at the weight of the moment as the dealer dropped the river card on board. It was the , and that was another miss for Marafioti with his very last shot. 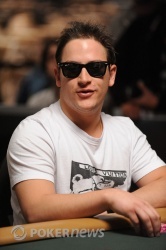 Unable to get over the hump, he has become the final elimination of this event, finishing in 2nd place for $381,507. It was a patient and measured final table for Marafioti, and he's been rewarded with a sweet payday -- the largest of his career -- to soothe his near-bracelet blues. Marafioti limped in from the button, Kwaysser raised, Marafioti reraised, Kwaysser set him all-in and Marfioti called. This time, Marafioti turned over . Kwaysser needed some serious help on the board with . 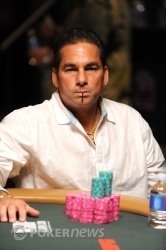 The flop was , Marafioti's aces holding. Kwaysser picked up a gutshot straight draw on the turn when the fell, but the river was the and Marafioti scored another double-up, this time to 1.8 million. Kwaysser is down to 6.2 million. Valdemar Kwaysser raised from the button, and Marafiotti reraised to get all 575,000 of his chips in there. He couldn't wait to turn over his , but he would need to fade Kwaysser's live in order to survive. He would. The dealer ran him out a friendly board of , and Marafioti draws first blood in this battle. He's back to 1.15 million now, giving Kwaysser the other 6.925 million. James Calderaro opened for 200,000, Valdemar Kwaysser re-potted, Calderaro moved all-in for 1.7 million and Kwaysser called. Kwaysser's jacks held up on the board, leaving him heads-up with a very short-stacked Matt Marafioti. For his third-place finish, "Caldo" will take home nearly $285,000. Action has resumed. There are 21 minutes remaining in Level 28.